080808 On,Now,To the Third Level: Earth Situations NOW 1 : NO, American Teachers do not need guns, they need this. Earth Situations NOW 1 : NO, American Teachers do not need guns, they need this. Ever had that squashing patronising phrase squeezed sideways at you? You are not a conspiracy theorist are you? The phrase "Conspiracy Theory" was one of the many genius CIA inventions, this one from 1967 to stop people prying into JFK's murder. Means No Fishing Here, when there are fish all over the place. Psalm 2 clearly says there is a conspiracy, and anything written that long ago would not still be relevant , but for one thing. What Jesus referred to as "the generation of unbelief", referring to the whole Adamic spiritual state, is still with us, and one of the things the state of Genesis 3 orphanhood does, is feeling that the whole universe is against it, it feels it is necessary toput artificial plans in place to twist things in its direction. Jesus referred to this whole attitude as "the sons of this present age, (there it is again) are more shrewd than the sons of the Kingdom." For some reason it is important to the Elite to get Americans to disarm. There are just too many similarities between each shooting incident. To me they are staged to create a revulsion against all private ownership of weapons. 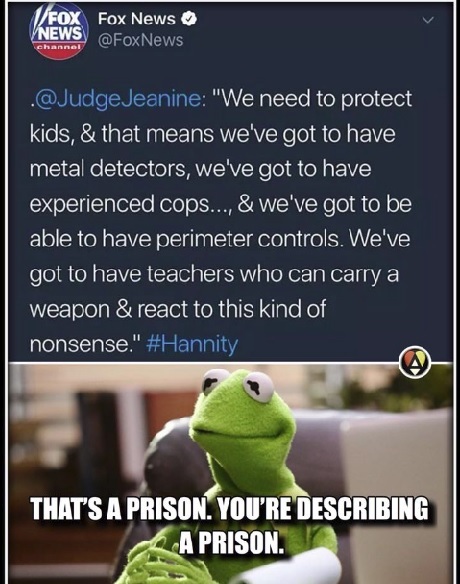 But the mirror view seems just as extreme, when Trump says schoolteachers need to be armed. America's Teachers do not need arms if they can keep adjoining doors in the building firmly shut. Traditionally locks can be shot off. This gadget holds doors tight.